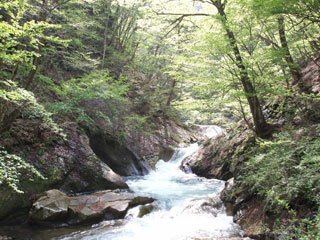 Nishizawa Valley (西沢渓谷, nishizawakeikoku) is the valley of Fuefuki River(笛吹川) located in north Yamanashi. It is a part of Chichibu-Tama-Kai National park(秩父多摩甲斐国立公園). There are many mountains around the valley, and the valley itself has great hiking course, takes about 4 hours), with the beautiful waterfalls including Nanatsugama-Godan Falls which is one of the 100 best waterfalls in Japan. Green leaves are very beautiful after the season of cherry blossom, and also the autumn leaves are excellent. There are many fee parking around the entrance of hiking course. Their you can get a maps of the hiking courses. The sidewalk of the river is well constructed, so even it is hard river, you can enjoy walking without any heavy duty tracing stuff. 0. at Yamanashi shi Station.